The Street Museum of Art (SMoA) is a public art project that started in New York City, challenging people's perceptions of street art. They adopt the guerilla tactics of street artists and curate exhibitions of found art, labelling them as if they were in a formal gallery. 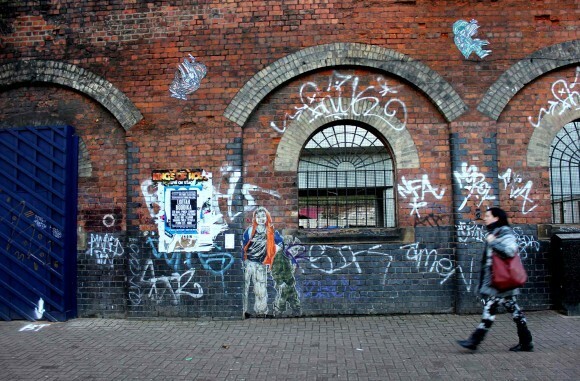 In December SMoA hit the streets of Shoreditch and "curated" an exhibition, Beyond Banksy adding "This is Art" labels to found work by C215, Christiaan Nagel, Eine, Mobstr, Pablo Delgado, Phlegm, Roa, Run, Skewville, Space Invader, Stik, and Swoon. Check out the video below to see them at work. But SMoA goes further than that. Blank, self-adhesive labels are available to the public on their website — ready to be filled out with a personal description and posted around the city on art works of your choice. Add your label, take a photo of the exhibit and submit to SMoA's website. All photos submitted of found works of art with their labels will then be added to SMoA’s collection, documenting the progress of this project. Join them! The Street Museum of Art Hits London from SMoA on Vimeo.